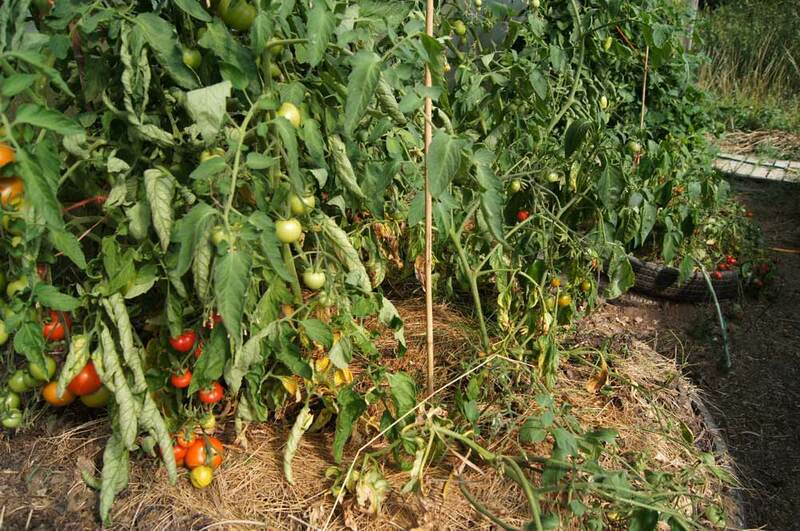 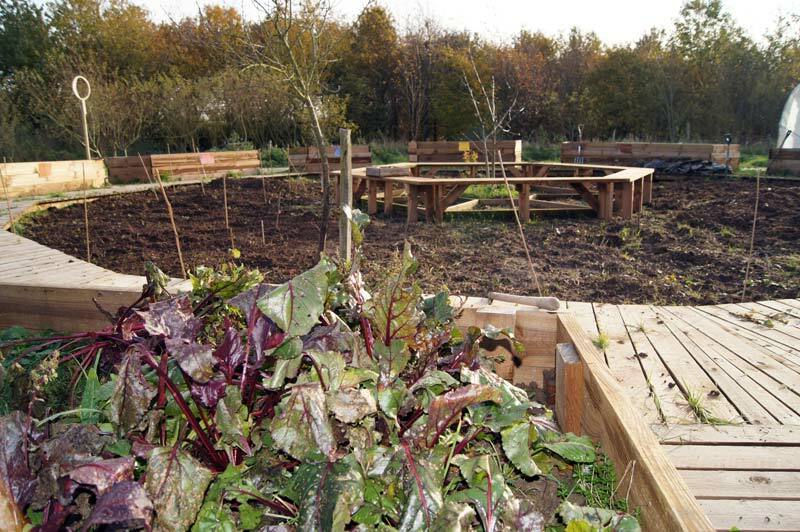 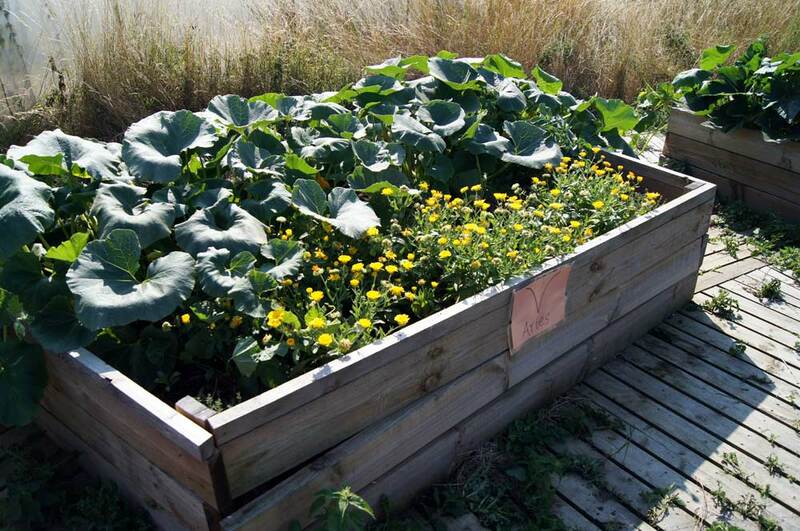 The Celestial Garden project has completely transformed the farm's overgrown vegetable garden. The garden is amidst a shelter belt of willows to the north and other trees and bushes to the east and west. 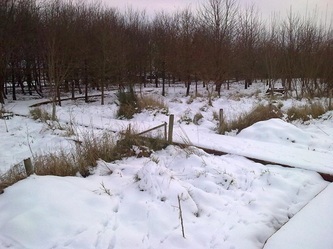 There is a woodland area to the south which protects the garden from prevailing south westerly winds. 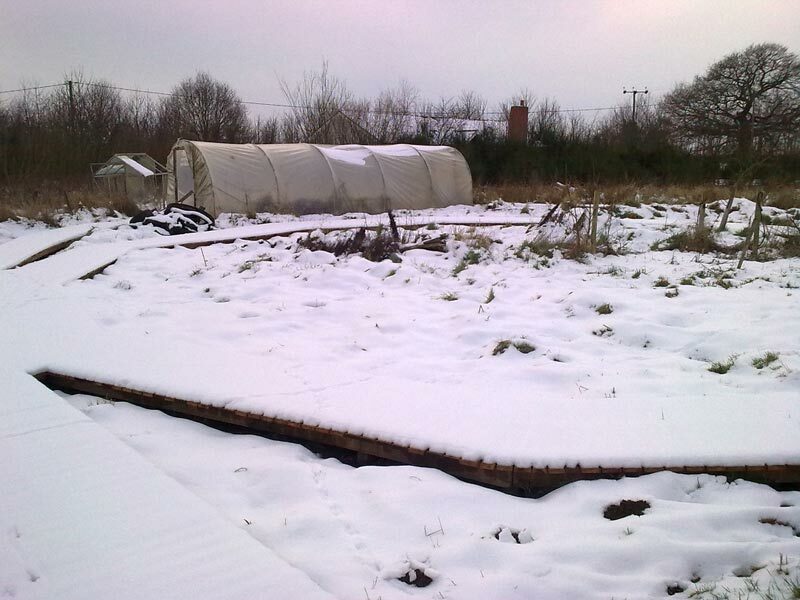 There are two working polytunnels on the site. 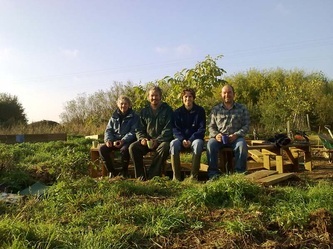 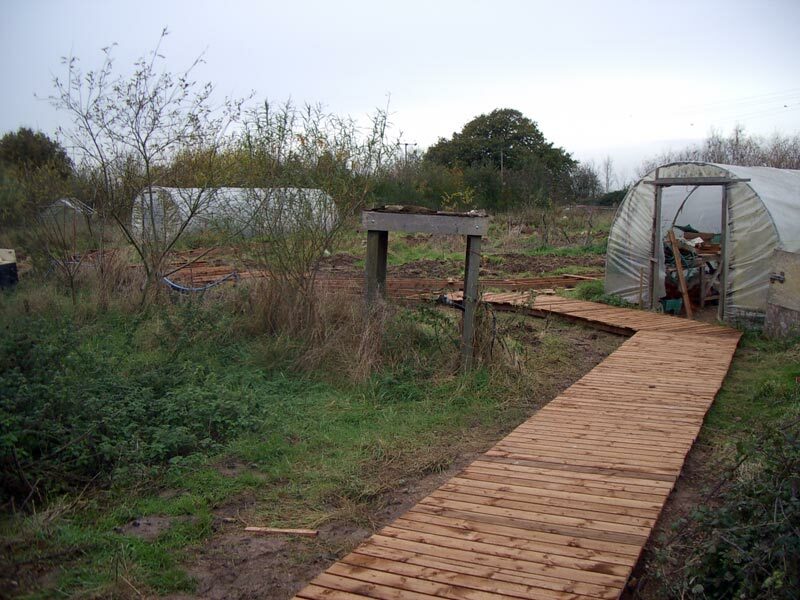 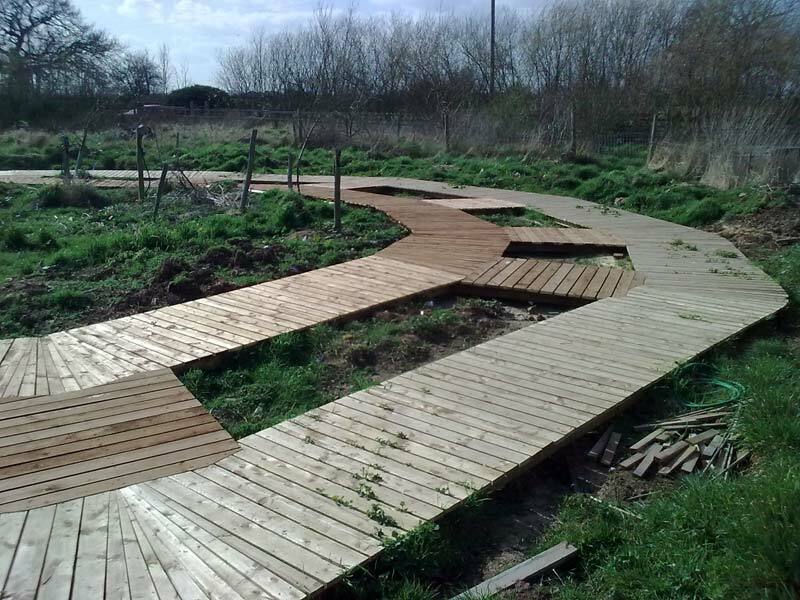 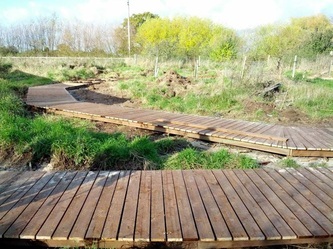 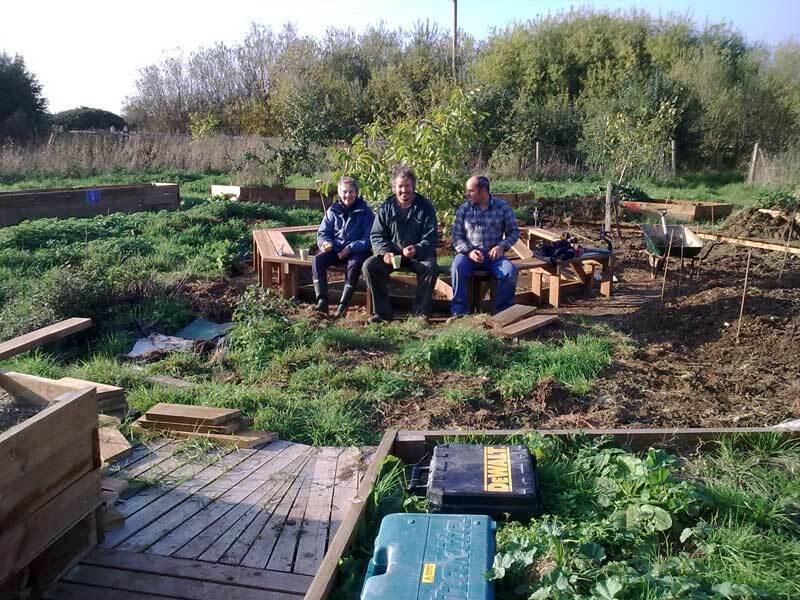 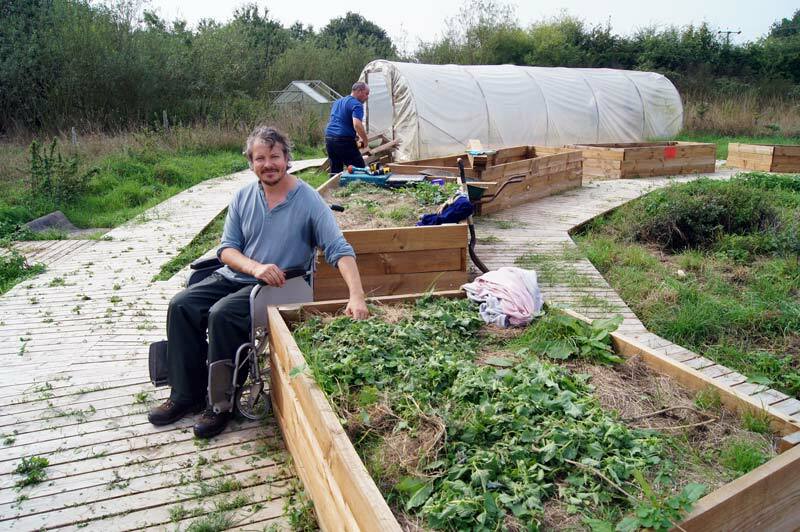 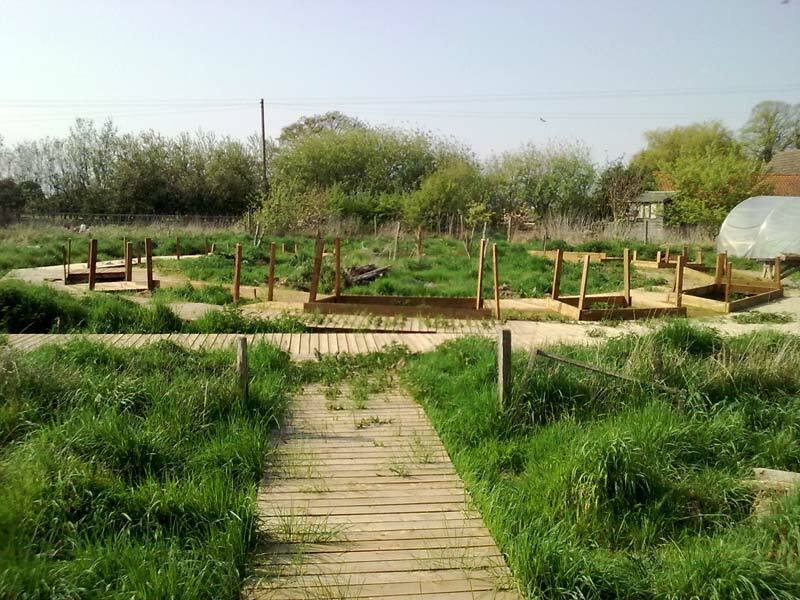 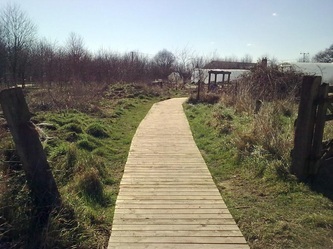 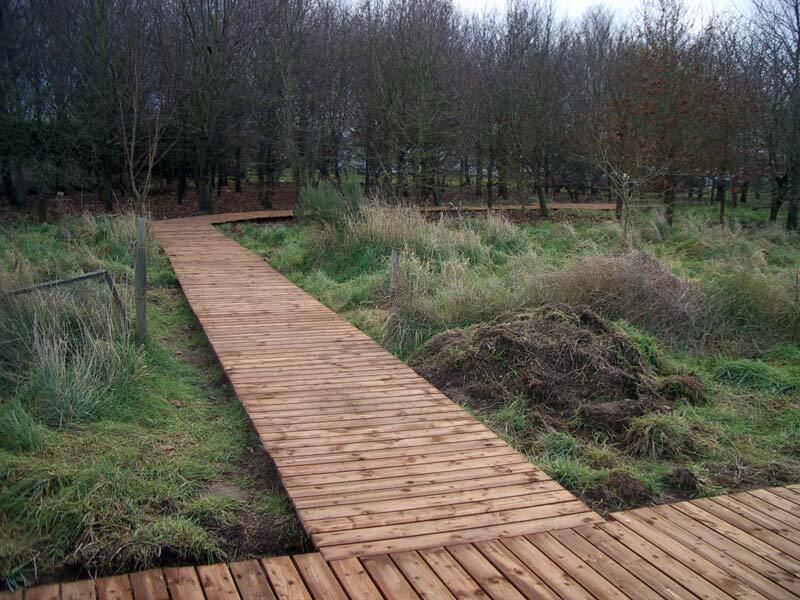 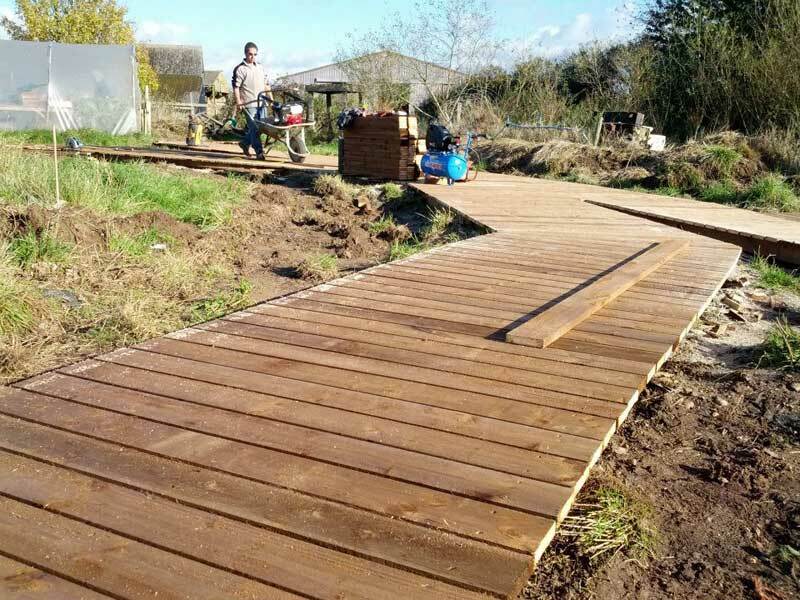 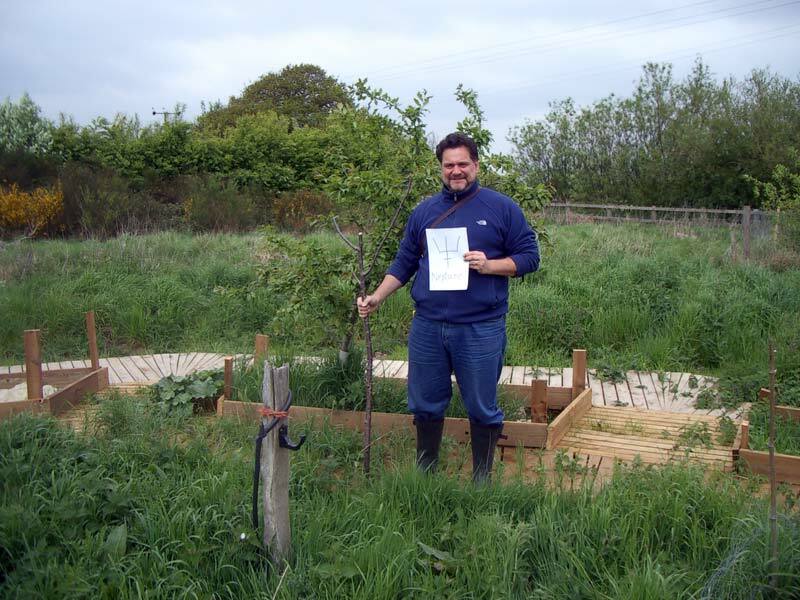 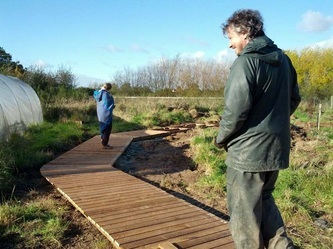 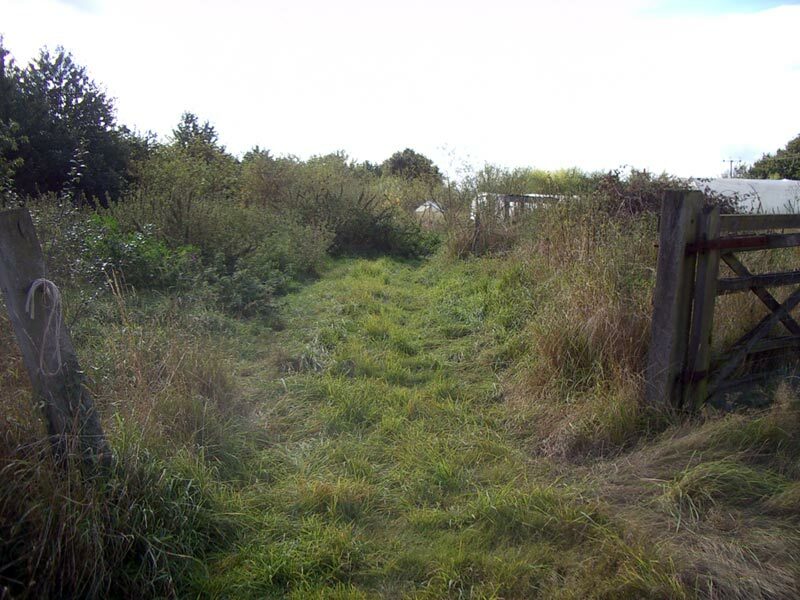 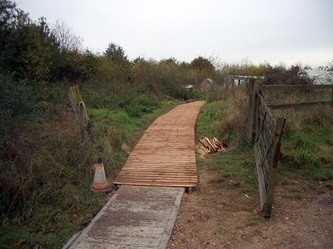 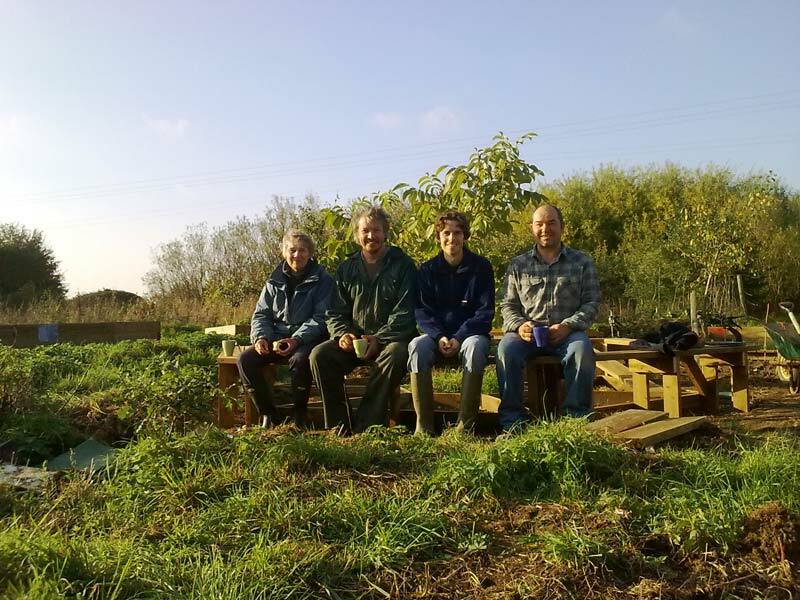 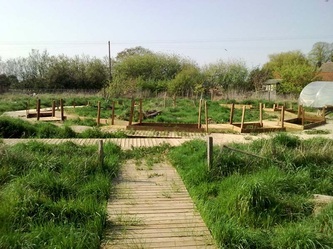 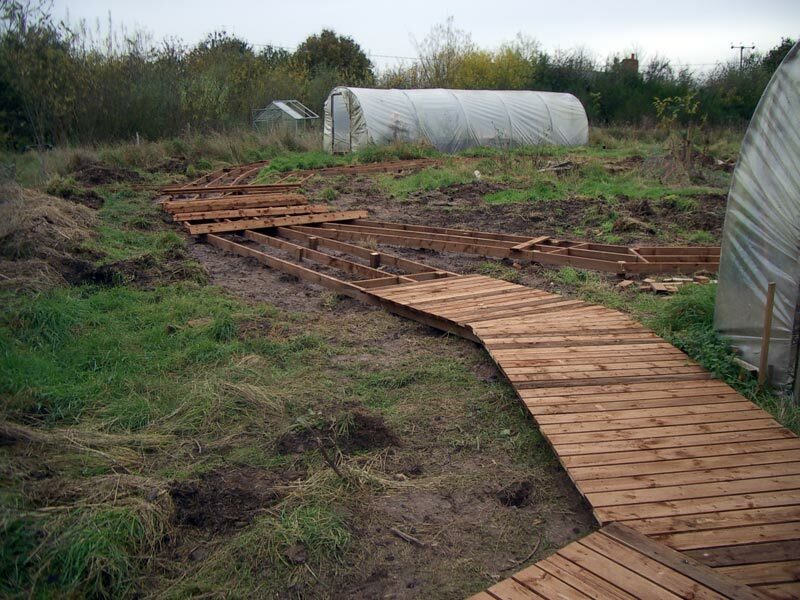 Spencer has been given funding from Natural England to build wooden decking paths around the farm enabling access for wheelchair users. 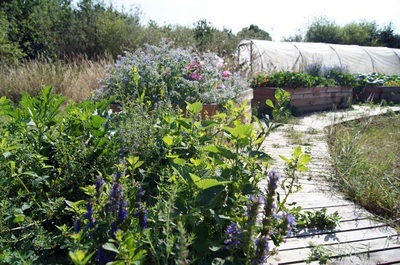 We entered the old vegetable garden for the first time in August 2012. 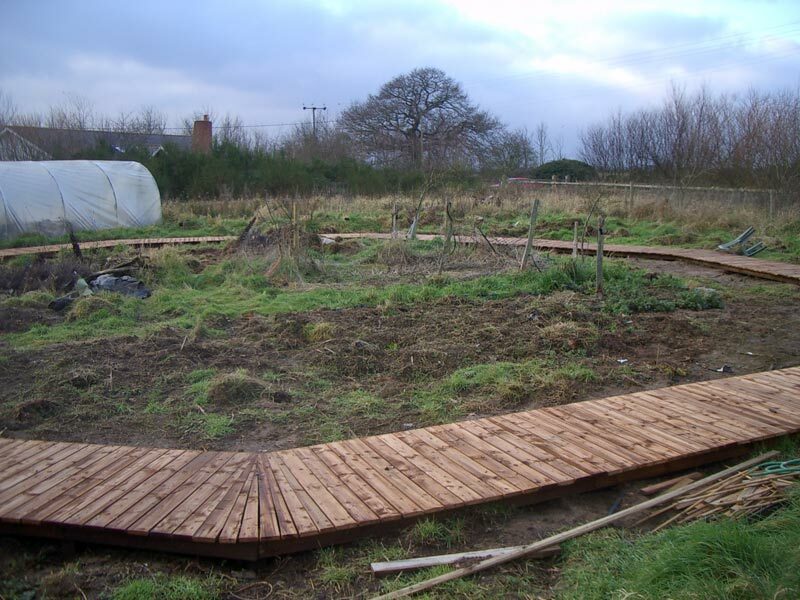 The Celestial Garden project existed in idea form only and it began to look like a very daunting task! 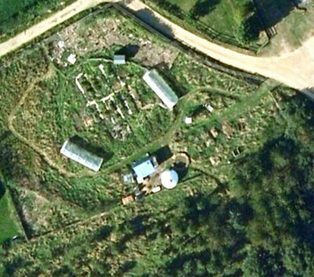 We could see the polytunnels, but the entire site was extremely overgrown, wild with grasses, thistles and nettles to name but a few. 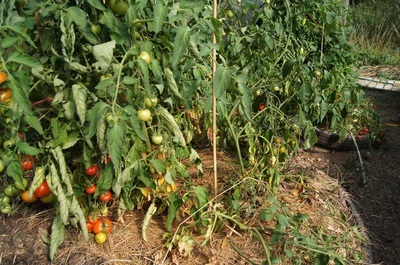 These mighty plants reached head height (and for people who know Spencer, that is very tall)! 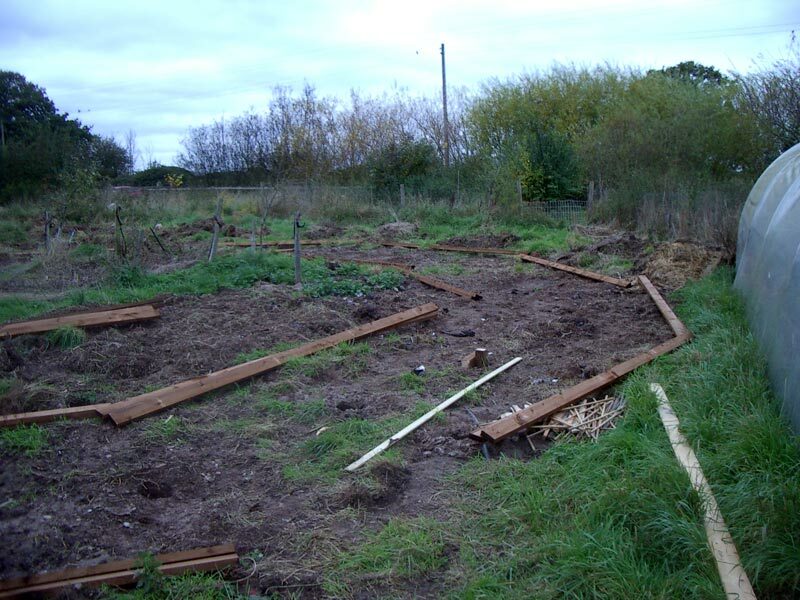 By September we had drawn plans for the new garden. 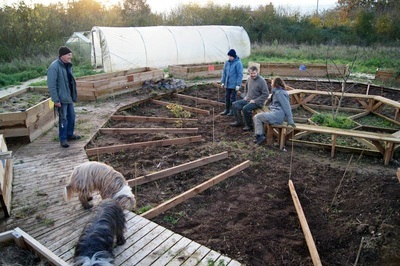 It would be circular in shape with twelve raised beds spaced around the circumference. 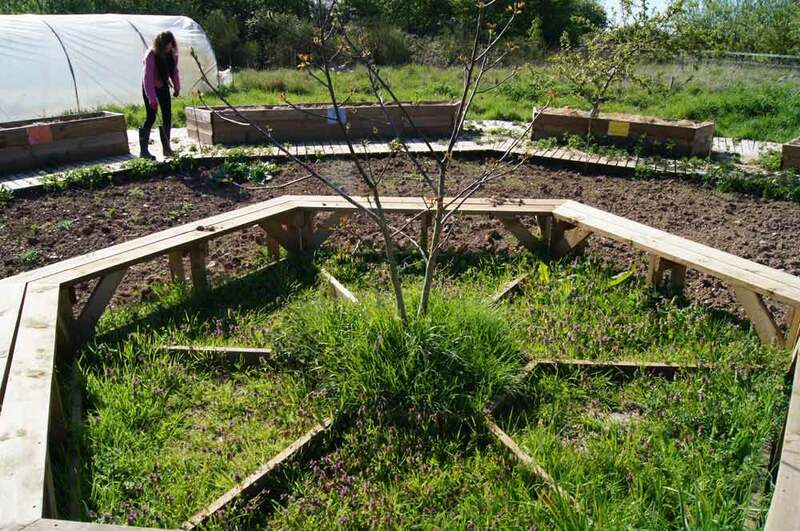 Each bed would represent one of the twelve zodiac constellations. 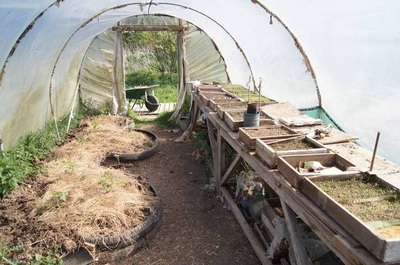 The size of the bed will be in direct proportion to the length of time the moon appears in that constellation during a lunar month. Spencer was very excited by all the possibilities that this design would bring as a teaching aid in demonstrating the lunar rhythms and the workings of the Biodynamic sowing and planting calendar. 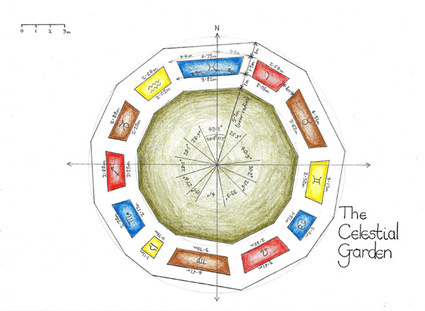 Soon afterwards, Spencer came up with an apt name for the garden as well - "The Celestial Garden". 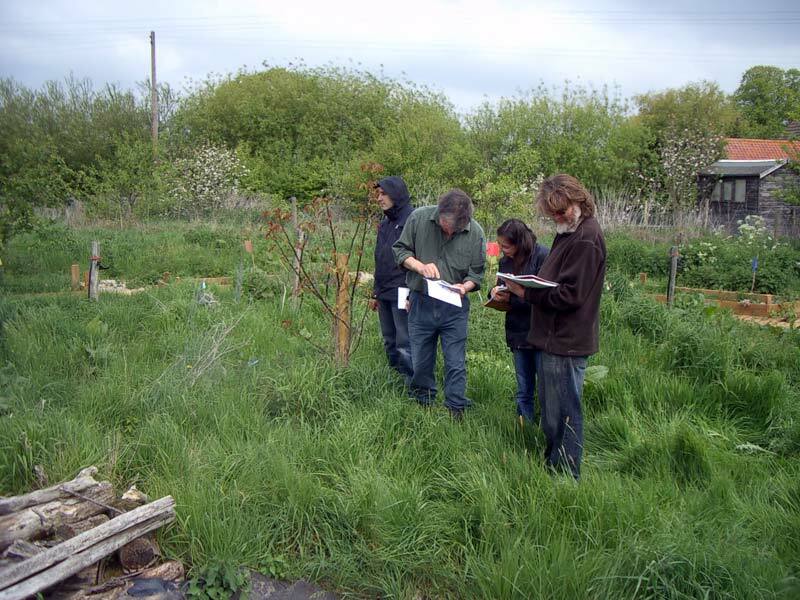 Our ideas were beginning to take shape and we felt the 'Michaelic wind' behind us. 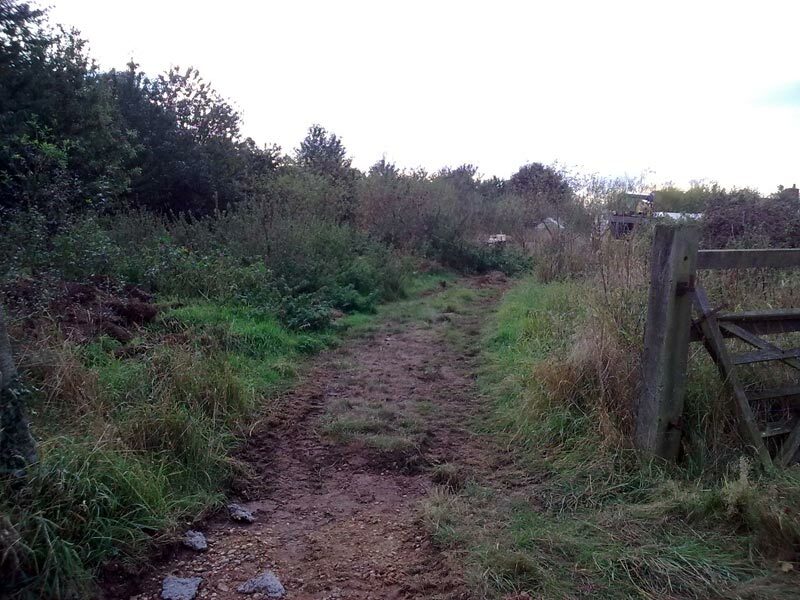 Michaelmas has arrived and the clearing work continues. The outline for the paths have been marked out with bamboo canes. Spencer is still busy scything and willing volunteers are helping with clearing, digging, raking, wheelbarrowing and composting. All this is going on whilst we suffer a multitude of bites from disturbed mosquitos, nettle stings and thistle prickles. 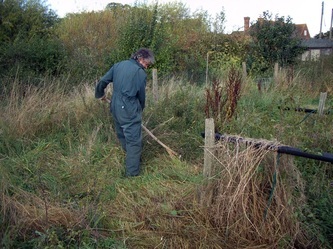 It is unfortunate that we have to disturb nature and wildlife in this way but sometimes sacrifices need to be made to achieve something special! October, and the builders have started to clear the site for building the wooden boardwalk paths for the garden. 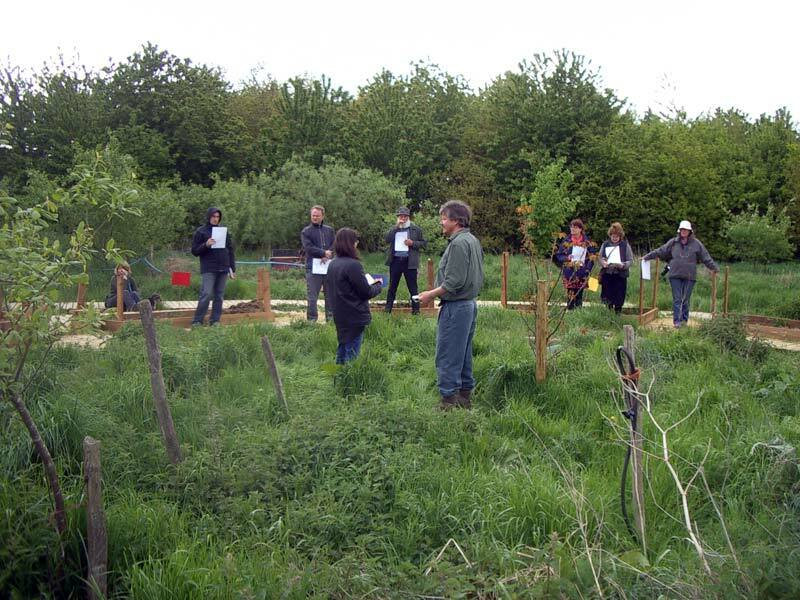 The garden design has at its centre a young walnut tree which seeded itself around the time that Spencer started working the farm. 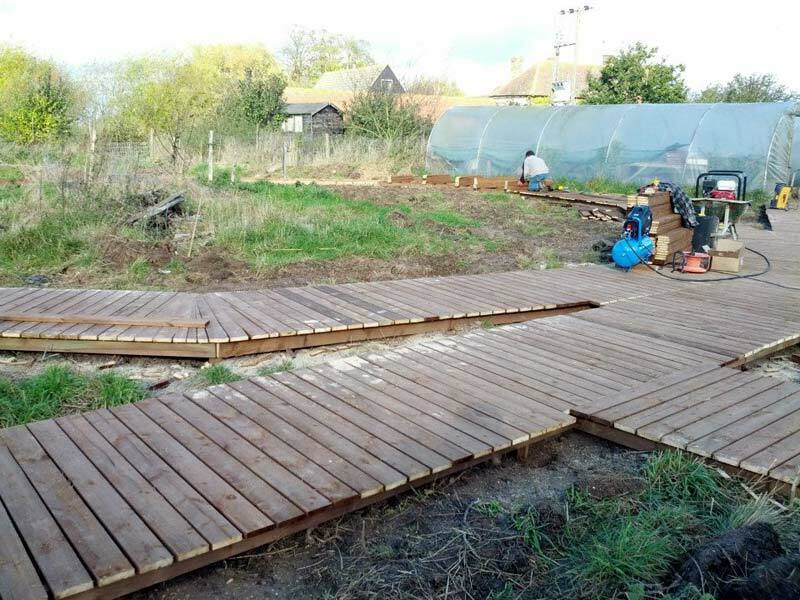 Another week has passed and the timber has been laid out in preparation for creating the understructure for the decking paths. 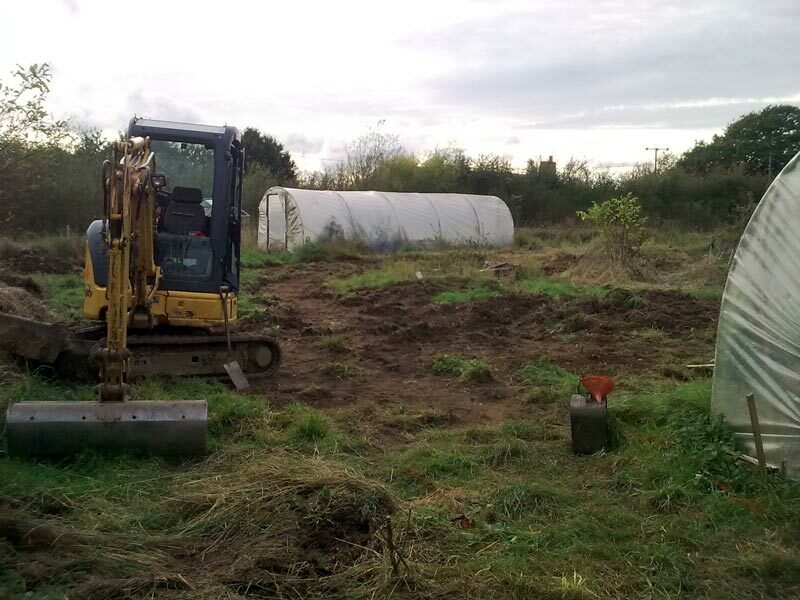 Spencer has been tactfully discussing plans for the design of the garden with the builders. I think the builders had been expecting an easier task than creating a nine metre diameter irregular dodecahedral pathway structure! 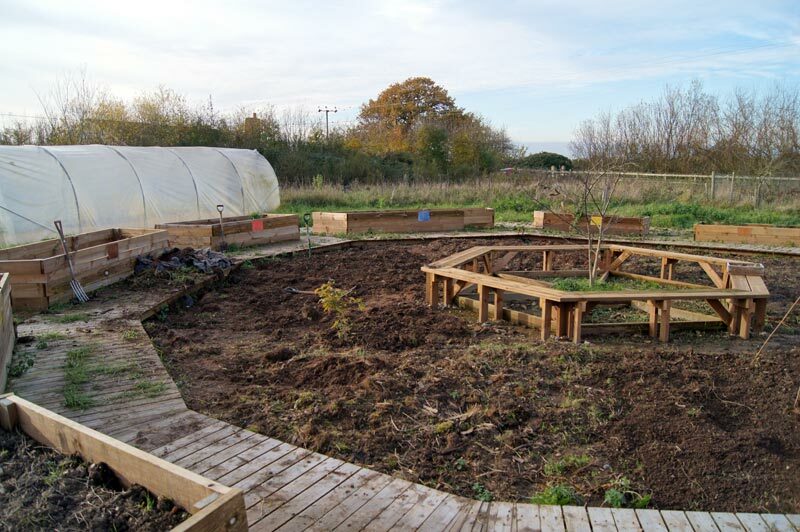 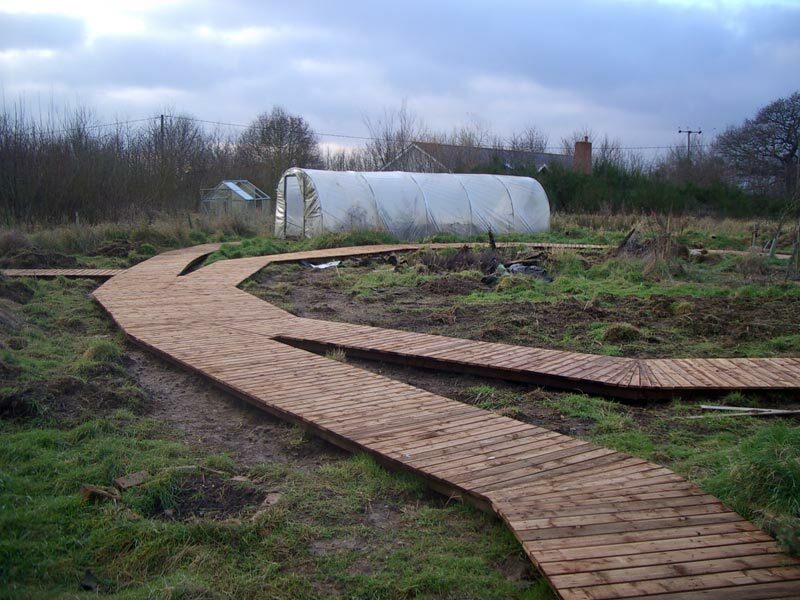 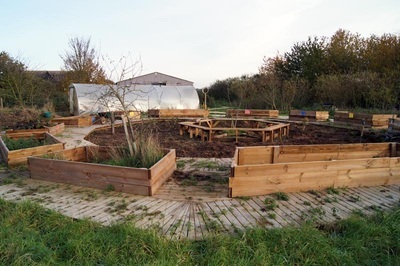 The builders have been working quickly and most of the pathway framework is complete for the outer ring of the garden and the paths leading into the woods and into the western-most polytunnel. 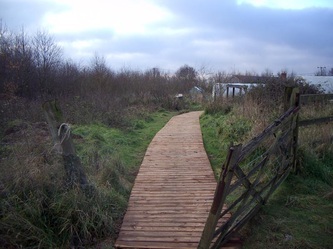 The entrance path leading into the garden has been completed. 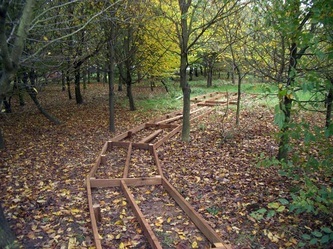 I hope now the builders have got into the project, they are secretly starting to enjoy themselves! The builders are nailing the boards onto the walkways and are now halfway round the outer ring of the Celestial Garden. 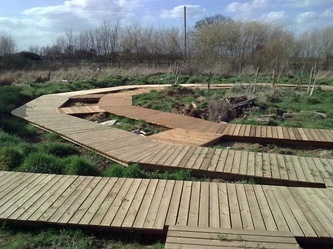 It's really starting to take shape and is very exciting to see our idea manifesting. 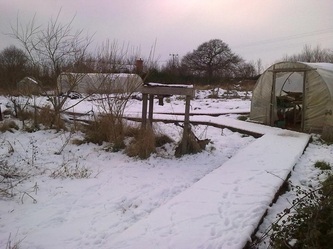 Another month has passed and the winter solstice nears. 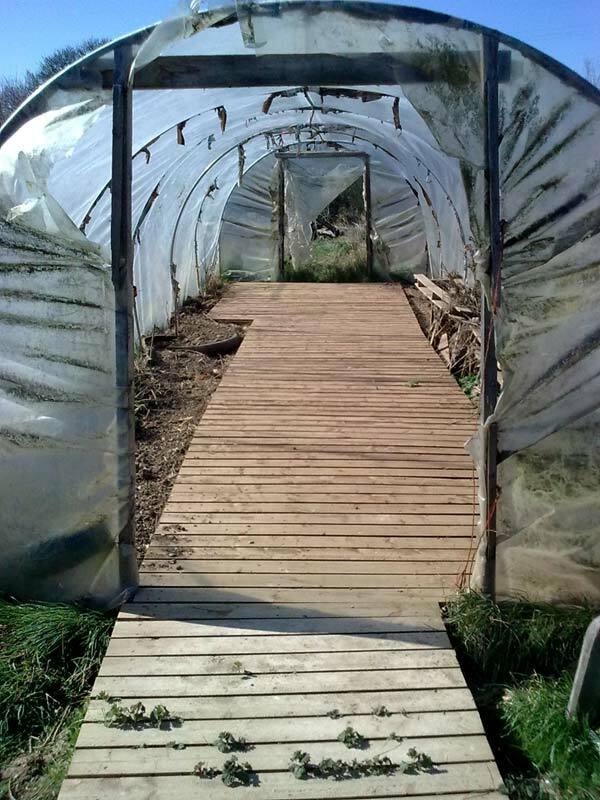 All the outer pathways are complete with just the inner ring of the celestial garden and the decking in the polytunnel still to be built. 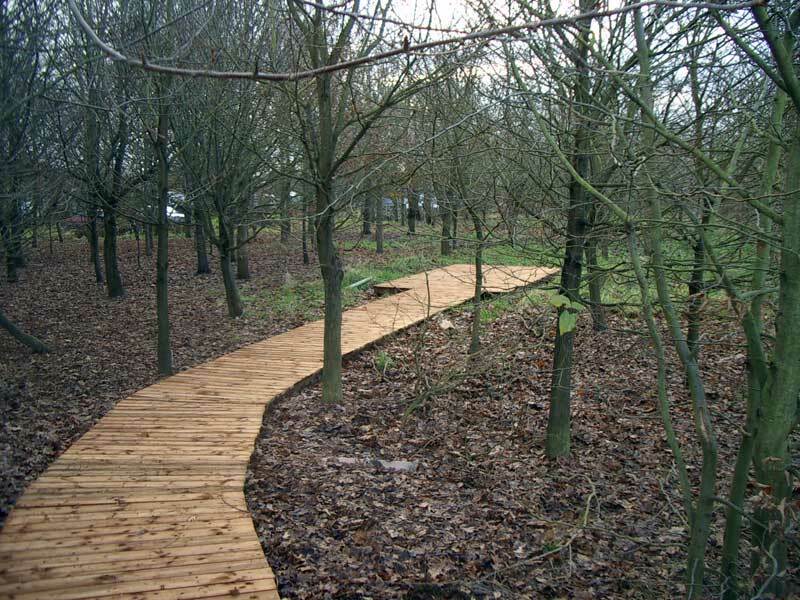 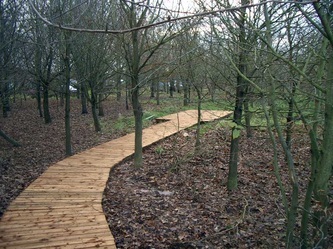 It feels amazing to walk into the woodland along the decking path. This will be a wonderful retreat for anyone seeking shade during a hot summer's day or space for some quiet reflection. 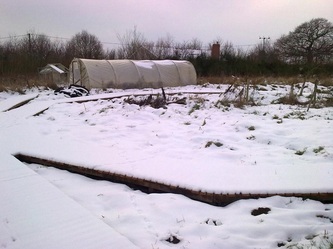 Winter has really taken hold now and snow covers the farm. It was very serene and peaceful in the Celestial Garden today. It was amazing to see the large variety of animal footprints in the snow covering the pathways and garden. 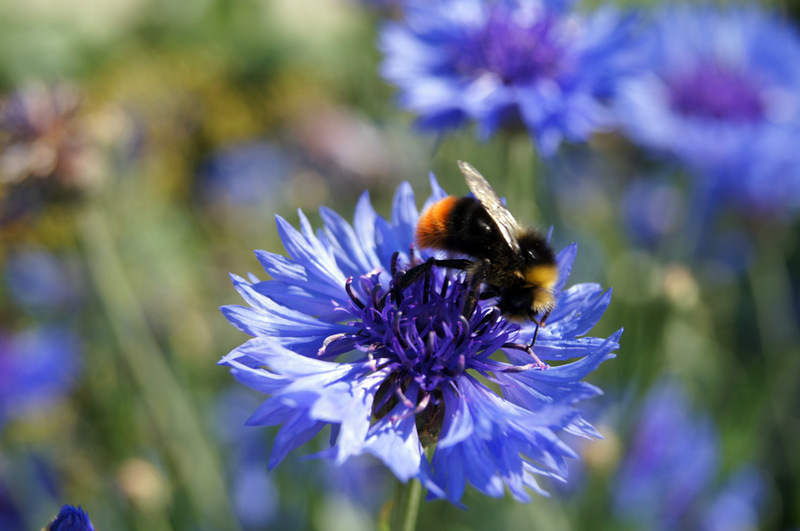 Even in these harsh conditions, it appears the garden is still a hive of activity for wildlife. 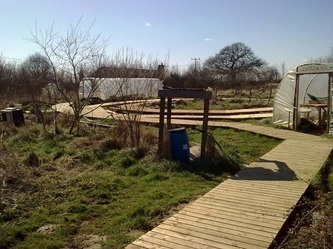 Spring has finally arrived after a cold winter and work is in progress once again in the garden. 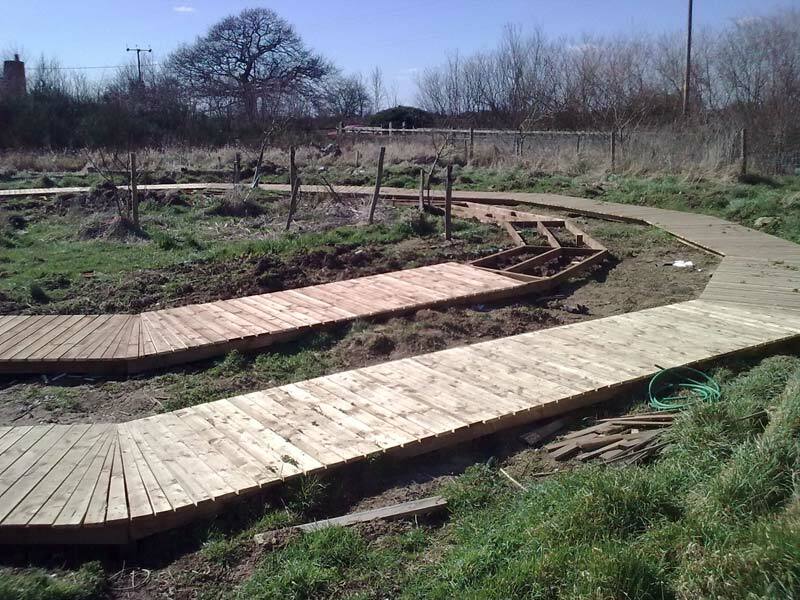 The framework has been laid for the inner ring pathway and the decking is being laid on top of it. 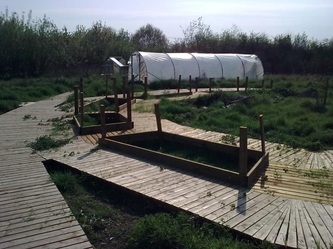 Decking has also been installed in the polytunnel. 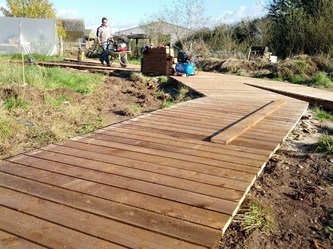 The decking paths are finished! 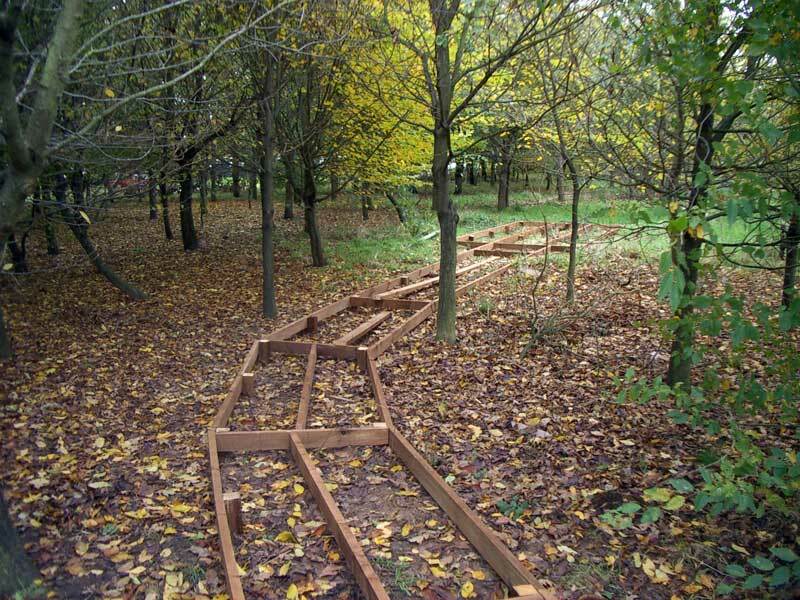 What an amazing job the builders have done. 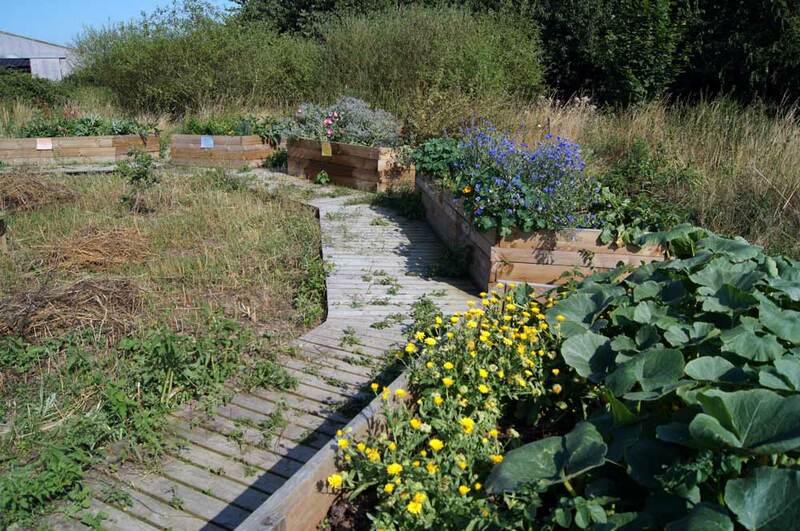 The Celestial Garden has an incredible feeling to it, especially whilst standing at thecentre by the walnut tree. 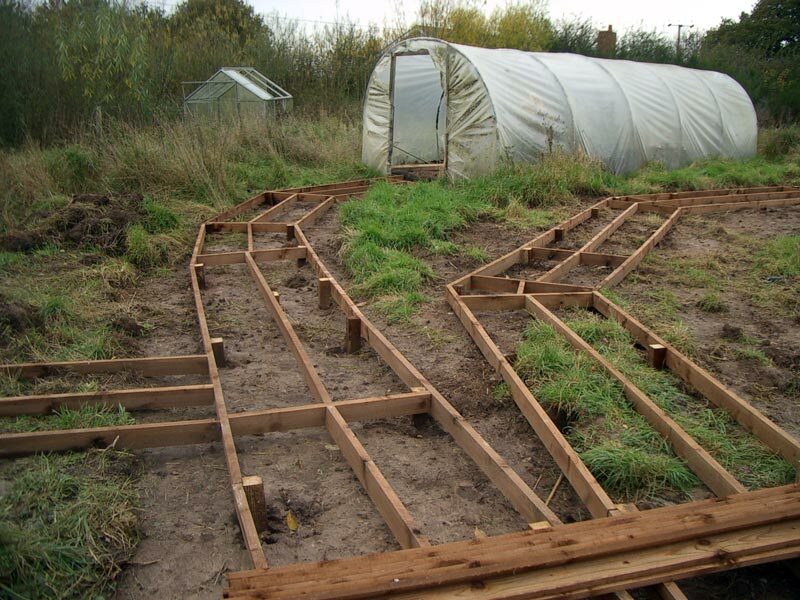 Now that the builders have gone it is time for us to start building the raised vegetable beds in between the decking pathways. Spencer has had another great idea which involves building the twelve vegetable beds at differing heights to represent the rise and fall of the moon in the sky throughout the lunar month. 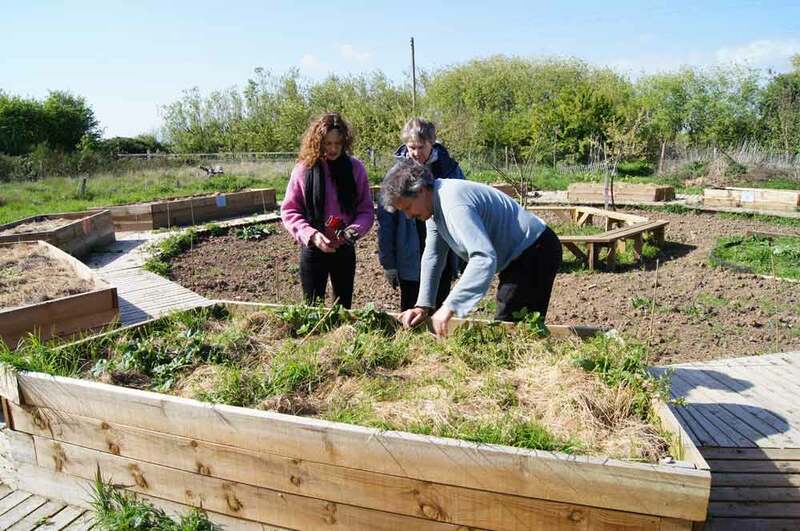 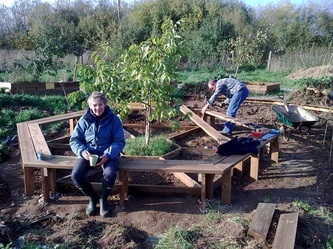 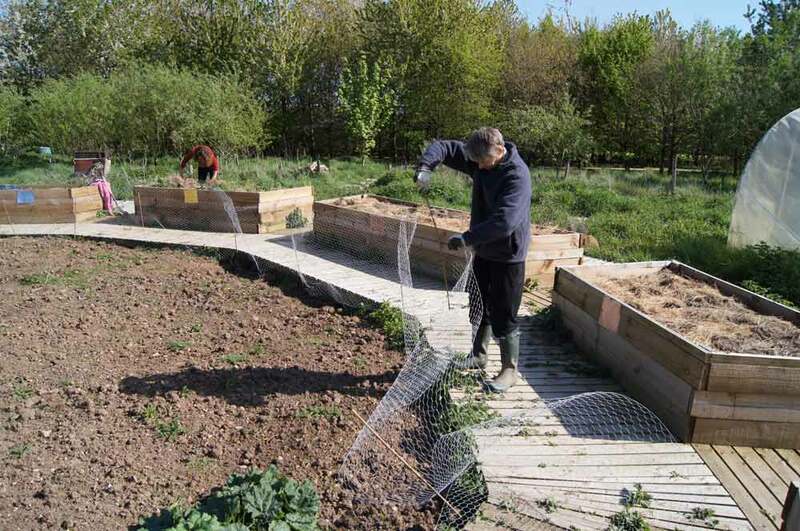 The raised vegetable beds are beginning to take shape but another huge task has confronted us. 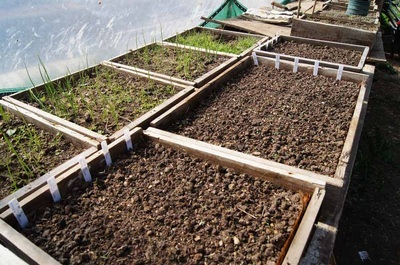 Whilst starting to fill up some of the shorter, shallower beds with soil, we have realised just how much soil is going to be needed, especially for filling the taller, deeper beds. 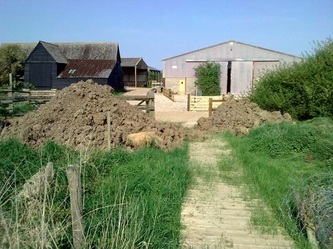 Spencer has organised for a digger to move piles of top soil from behind one of his barns to the Celestial Garden entrance to make this task slightly easier. 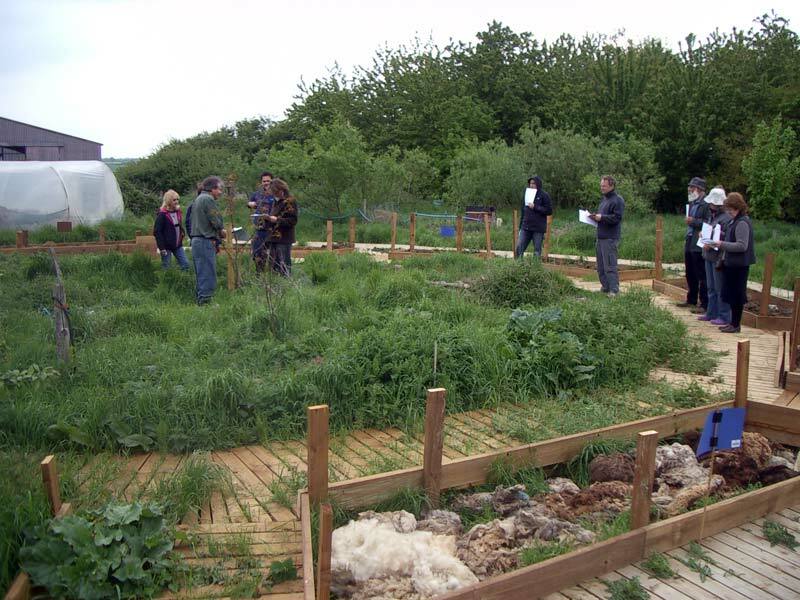 Today the Celestial Garden has been put through its first test as an aid for teaching the biodynamic planting calendar. It is the final day of the first biodynamics training course and Spencer has enlisted the help of the students to represent the different planets including the moon and sun. We then looked at various days and replicated the positions of the planets in the garden to give us all a better understanding of how the planting calendar works. 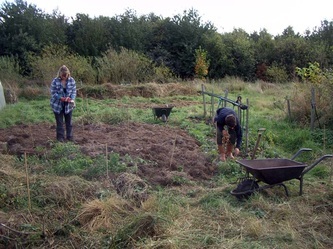 Another summer has passed and Michaelmas is nearly upon us again. 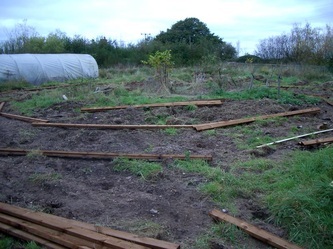 The vegetable beds are built and many of them have now been filled with soil. Today, we have been filming a preliminary video to demonstrate the wheelchair access on the farm and in the Celestial Garden. 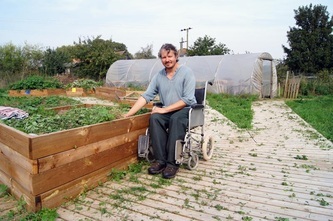 This film will be sent to prospective charities and local groups with a view to them becoming involved with bringing people with disabilities to the farm. 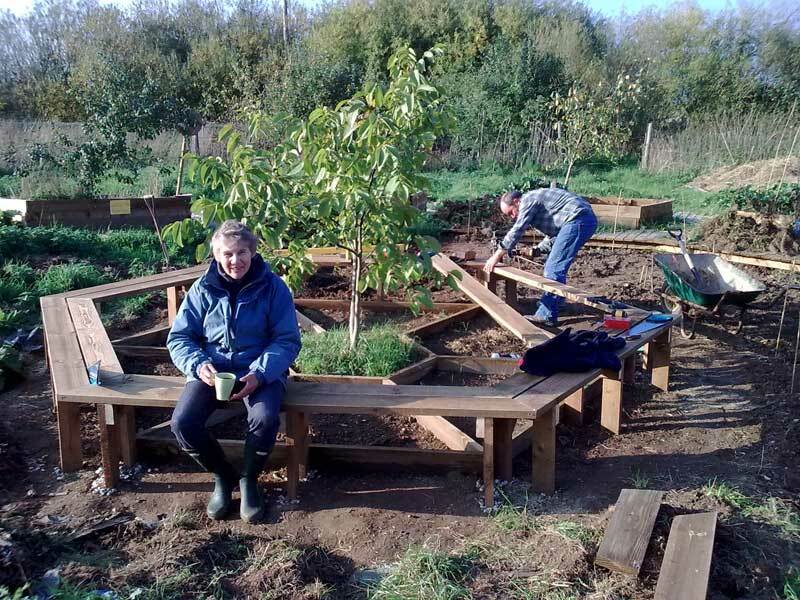 For the last few weeks now, Spencer and the volunteers have been busy in the Celestial Garden, working within the inner circle. 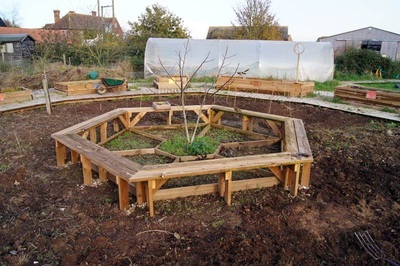 Gordon has built a hexagonal bed in the centre of the garden surrounding the walnut tree. 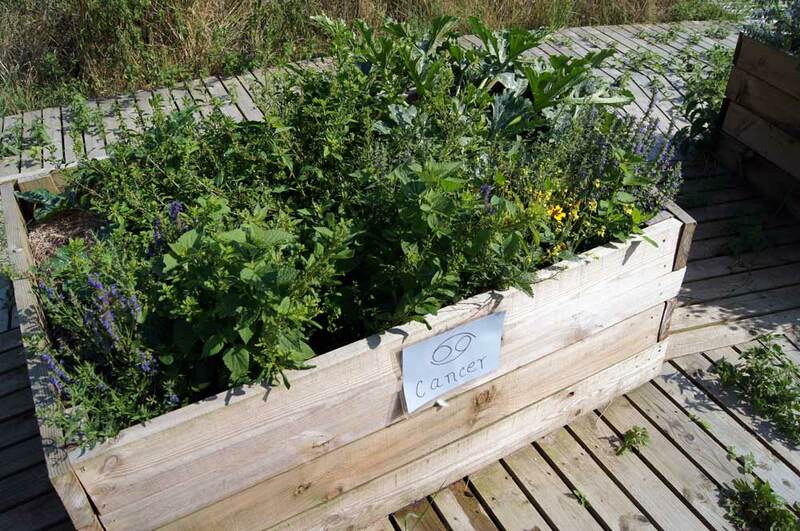 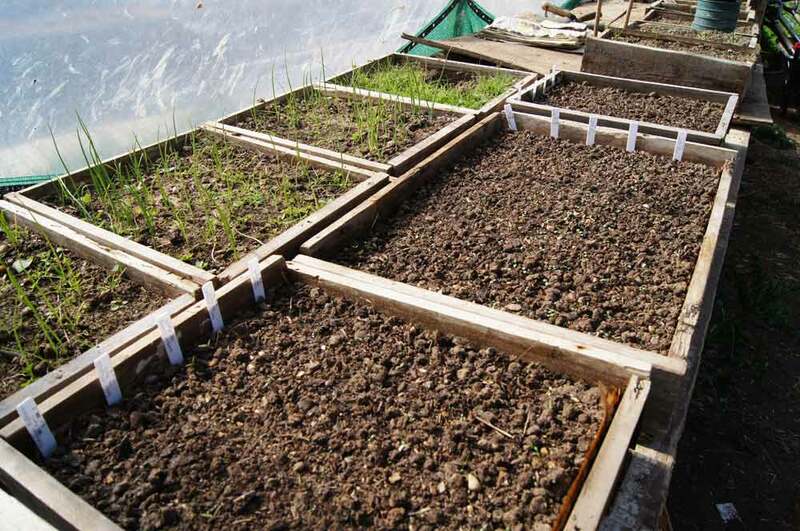 This will contain six sections for growing plants for use in the biodynamic compost preparations - chamomile, dandelion, horsetail (equisetum), nettle, valerian and yarrow. Gordon is now building a beautiful bench surrounding this hexagonal bed. The hexagonal shape has been chosen to honour the bees who create their incredible hexagonal honeycomb structure. Meanwhile, Spencer, Christiane and Martin have been busy clearing the inner garden of grass and other weeds. This has been quite a challenge because we keep finding old pieces of carpet under the surface, used as a weed suppressant in the old vegetable garden. 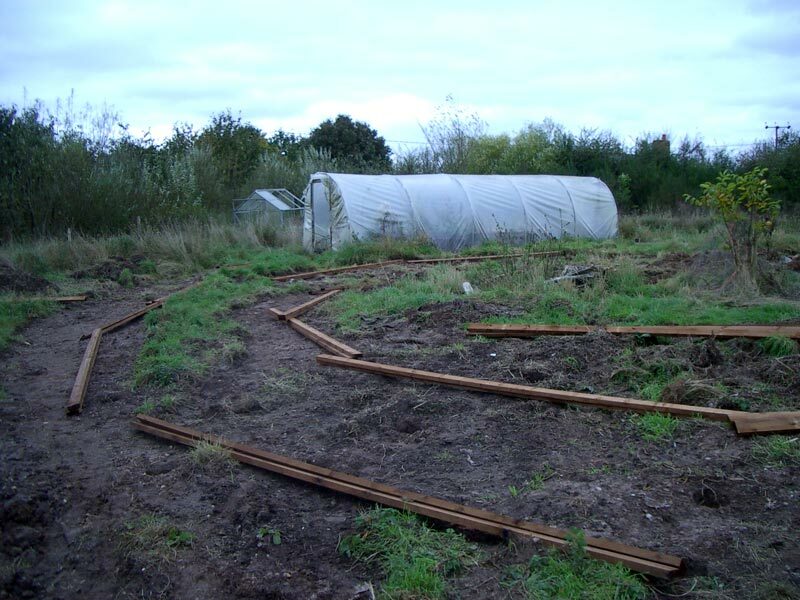 Because of the way it is degrading it looks slightly reminiscent of spaghetti which we have been amusing oursleves over! 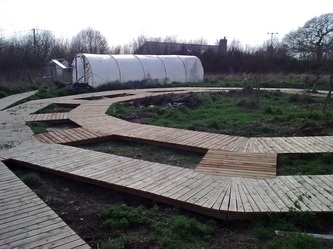 We've been finishing weeding the inner circle of the garden today and have also been thinking about what to do with the space. 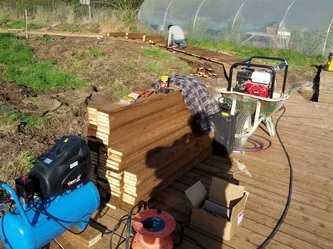 Spencer wants to build twelve flower beds he's calling solar rays. 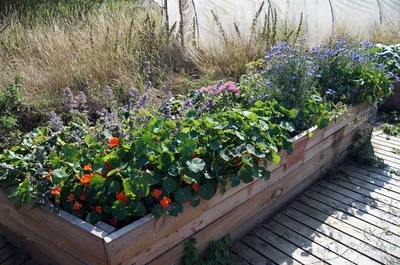 Each bed will contain plants that will flower in the time of year of a particular zodiac sign - therefore working with the solar year rather than the lunar month as the vegetable beds do. 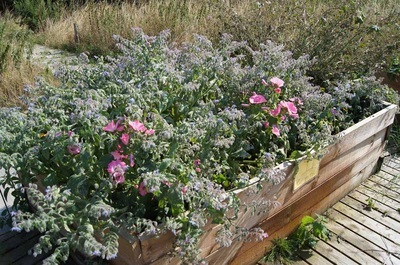 This will create a rotating flowering effect in the garden through the year. 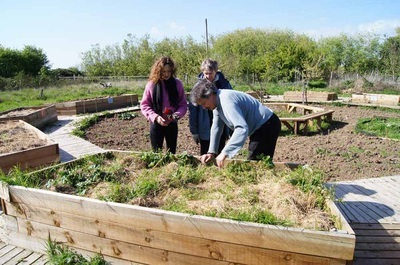 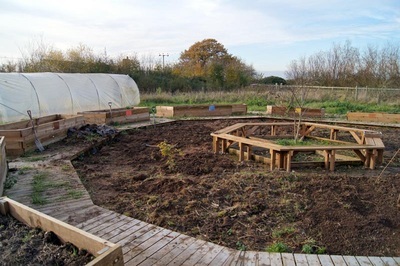 The aim for these beds is to provide food for the bees throughout the year. We spent much of this afternoon thinking about the design for these flower beds. 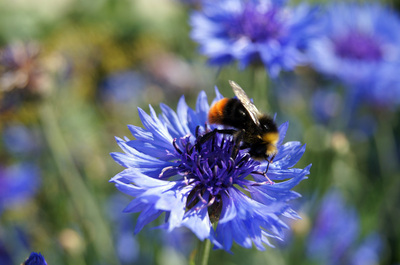 Spring time is here again and the garden is a hive of activity again after the winter months. 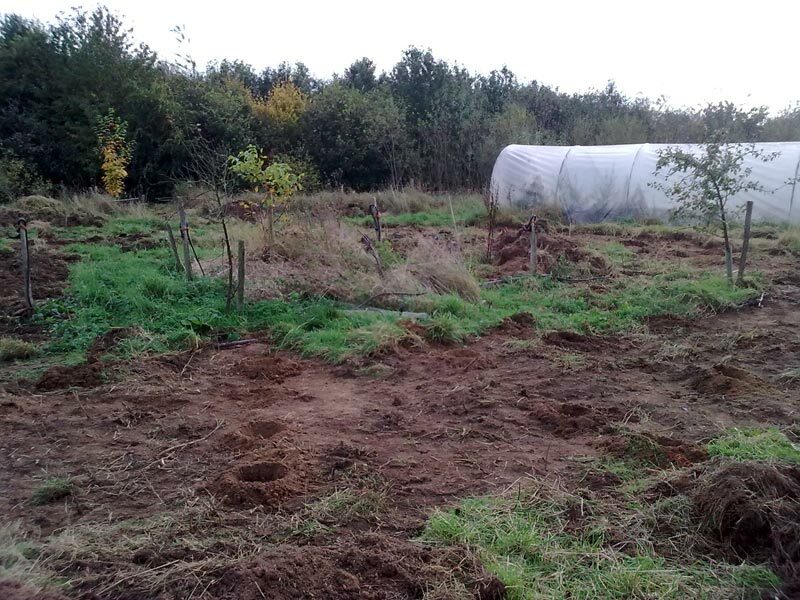 We have decided to create a wildflower lawn in the middle of the garden instead of having the previously planned flower beds. 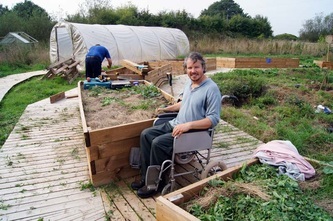 Spencer sowed the lawn seeds a couple of weeks ago which are just starting to germinate now. 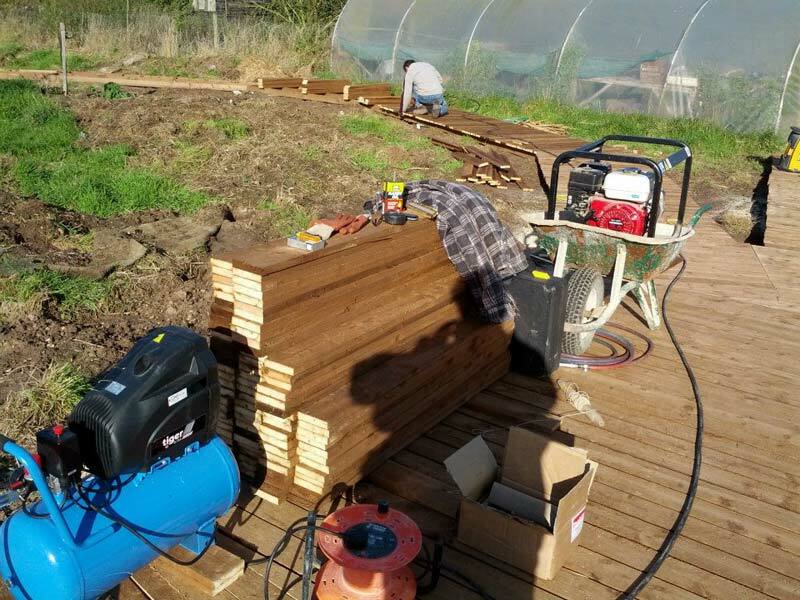 The flowering bee plants will now be planted in the inner half of each of the twelve raised beds to complement the vegetables. 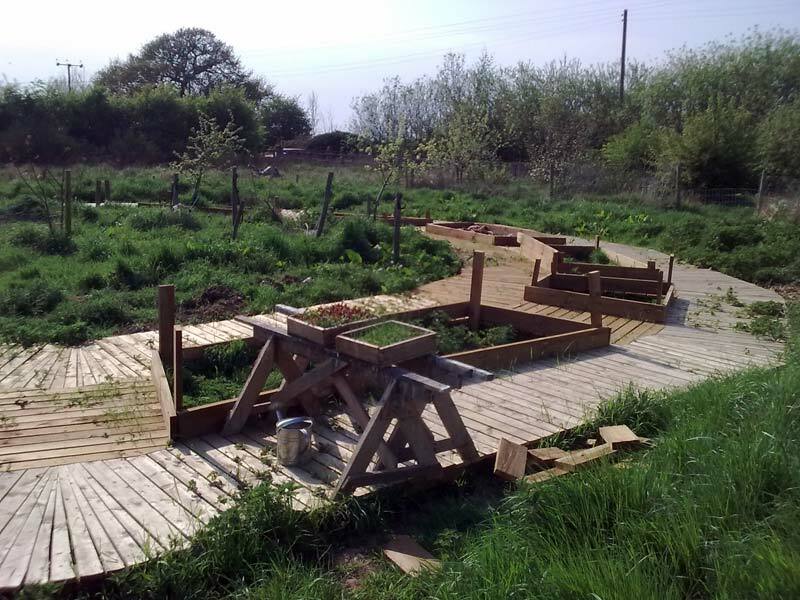 Another huge milestone has also been reached in the garden, this being that all the vegetable beds have now been filled with top soil! 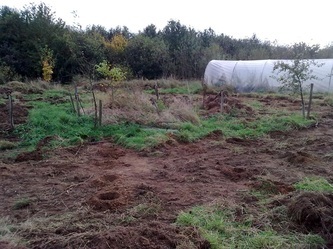 Today we were 'hopefully' rabbit proofing the inner lawn by installing a temporary chicken wire fence around the border. 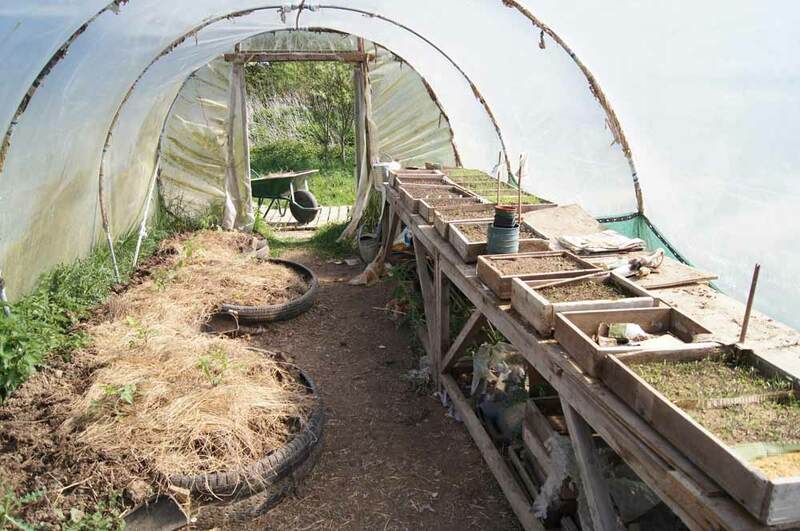 Lots of vegetable and flower seeds/seedlings are being tended to in the polytunnel. Tomato, pepper and aubergine plants have been planted and mulched in the polytunnel. 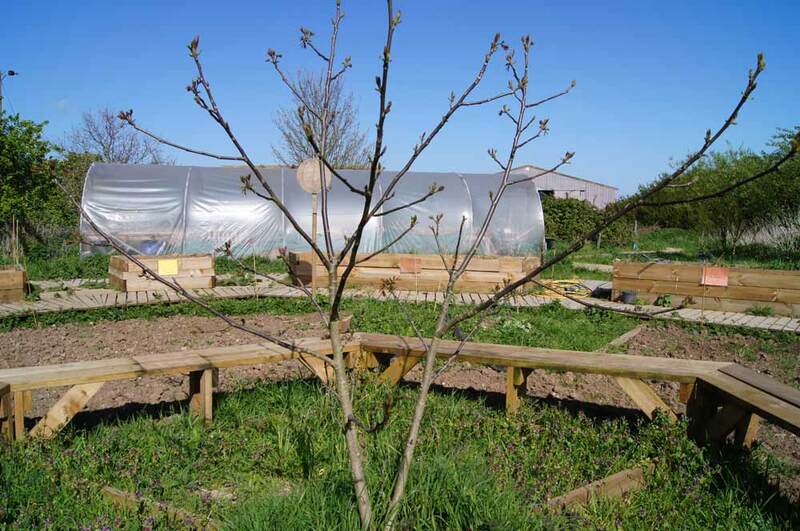 The walnut tree in the centre of the garden is just coming back to life with the new leaves just opening. It's very exciting to see the garden coming back to life again. The garden is full of life at the moment. The flowering plants for the bees are doing really well and are attracting a huge number of pollinating insects. 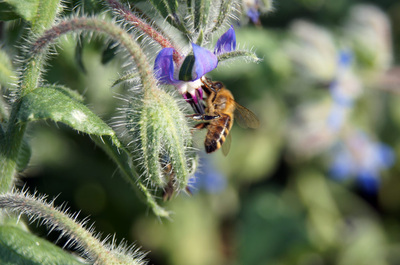 The bees adour the borage flowers!